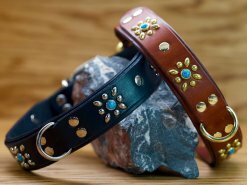 Receive sales notices and new product updates. 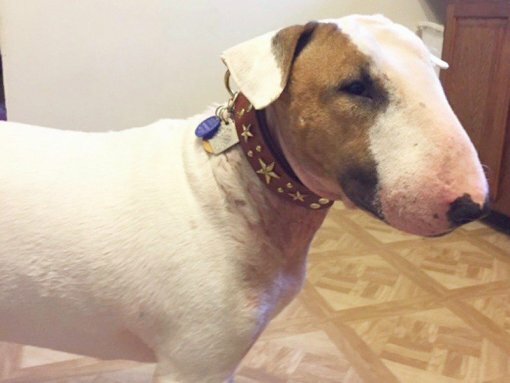 The easiest and fastest way to measure your dog’s neck size is to use a cloth measuring tape. Make sure to remove your dog’s collar before measuring! 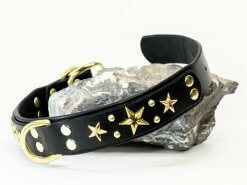 For the perfect fit, measure the same area of the neck where your dog normally wears his or her collar. 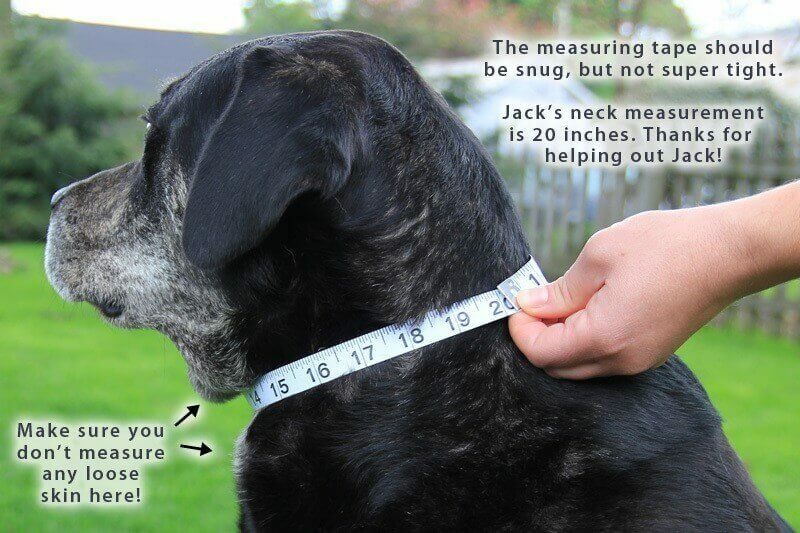 Make sure you get a snug measurement. Avoid measuring any extra skin around the neck area. 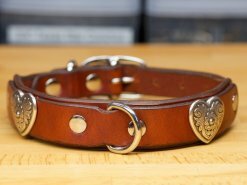 If you don’t have a cloth measuring tape, substitute a piece of string in its place. 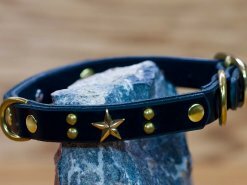 Use the string to measure as outlined above, then lay it on a flat surface and measure the length with a ruler or tape measure. It’s that easy! 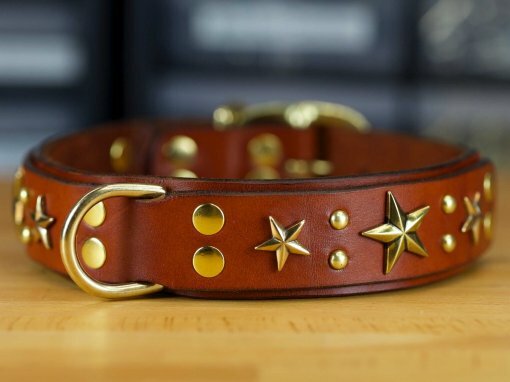 You just measured for the perfect custom-made Kobi Collar fit for your dog. 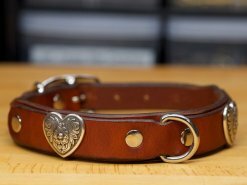 Depending on the type of your old dog collar here are the two most common ways to get an accurate neck measurement. Measure from the end of the male clasp all the way to the end of the collar fabric/beginning of the female clasp end. Plenty of stars and studs adorn this beautiful custom made leather dog collar. 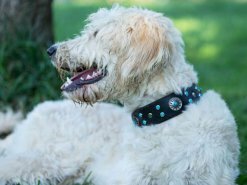 This double-layer collar has an extra d-ring for easy leashing/unleashing. 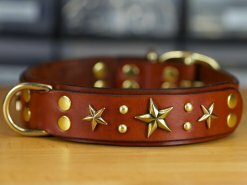 Size Choose an optionMD | 14" - 17"LG | 16" - 19"XL | 18" - 21"XXL | 20" - 23"
The Stars ‘n Studs custom leather dog collar is made with premium US tanned English Bridle leather. 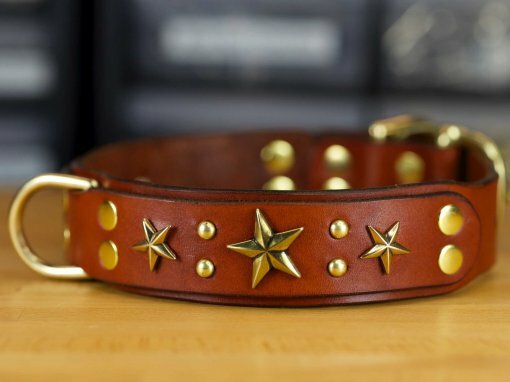 This is the kind of collar that only gets better with wear. We only use premium hardware made of brass, stainless steel, nickel plated brass, etc. All of our dog collars and leashes are cut from premium US leather hides. 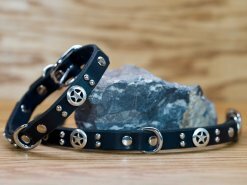 We use Latigo and English Bridle leather for its superior wear and all-weather durability. 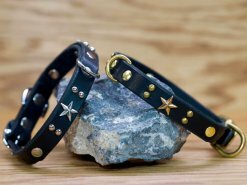 Our hardware is made from solid brass either in natural gold, nickel-plated, or chrome plated for a brilliant silver finish. 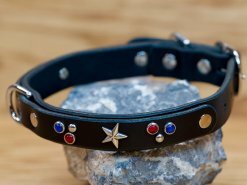 We stand behind our collars 100%. 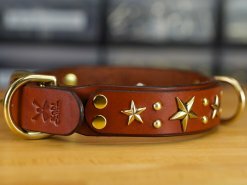 Each collar is carefully handcrafted just for your dog. 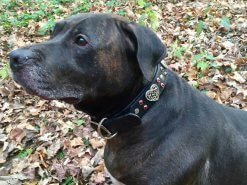 Feel free to drop us a line if you have any questions or need help with your collar selection. The easiest and fastest way to measure your dog's neck size is to use a cloth measuring tape. 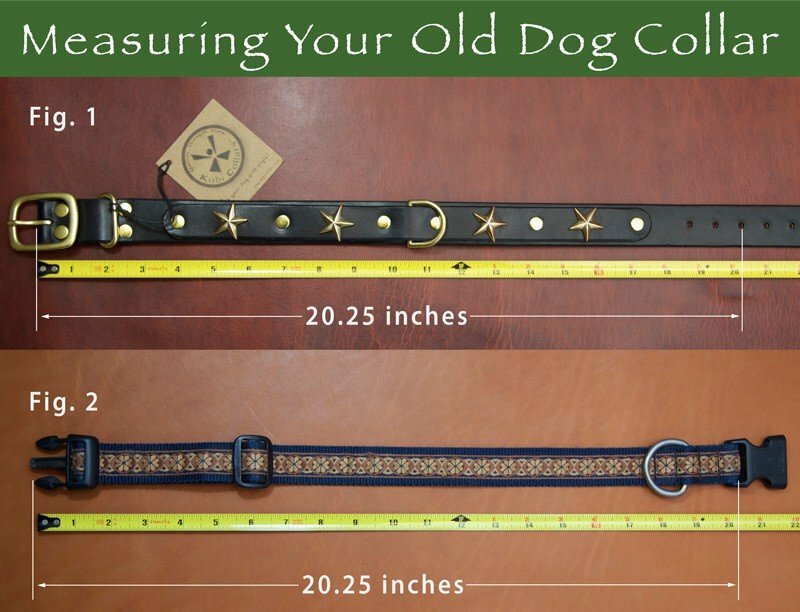 Make sure to remove your dog's collar before measuring! 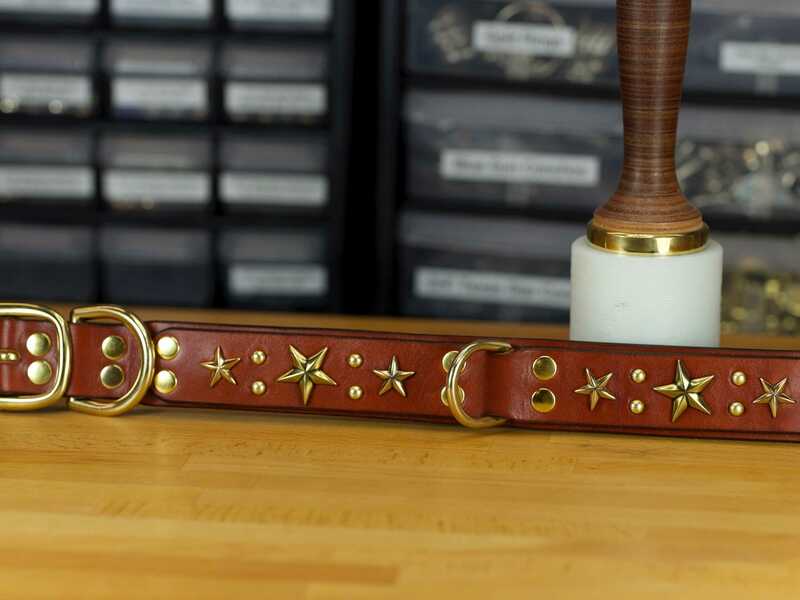 If you don't have a cloth measuring tape, substitute a piece of string in its place. 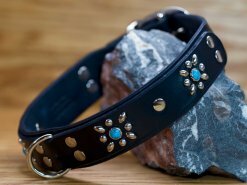 Use the string to measure as outlined above, then lay it on a flat surface and measure the length with a ruler or tape measure. It's that easy! You just measured for the perfect custom-made Kobi Collar fit for your dog. 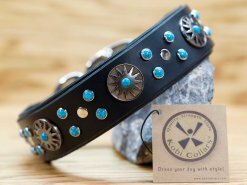 At Kobi Collars we handcraft the finest leather dog collars available. 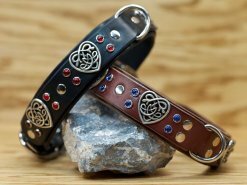 We only use the highest quality materials, and all of our dog collars are made with great care and love.